Do you remember the feeling of being invincible when you are in a M1 Abrams tank, taking down old school T72 tanks from the Soviet era with ease while remaining nicely protected within? Well, here is the £69.99 Bigtrak XTR that might just give you that sense of invincibility, albeit in a slightly different manner. After all, the first of Bigtraks did make their way into homes all the way back in 1982, sporting high tech features as well as programmable movement, making it the ideal toy for the 8-bit generation. Fast forward by three decades, and here we are with the Bigtrak XTR which completely revamps the design and comes jam-packed full of onboard technology. 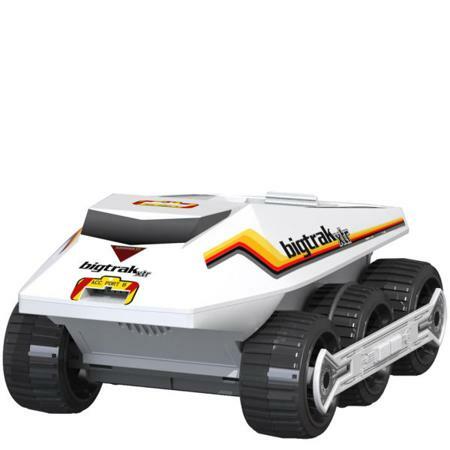 For starters, the Bigtrak XTR is a 6-wheeled, foot long programmable rover that boasts an exciting range of features, and will definitely be able to live up to its name XTR (which incidentally, stands for eXtra Technology Rover). Some of the more noticeable features include control of the XTR over a smartphone or tablet device (it can be an iPhone or the iPod touch and iPad, or basically any other device that runs on the Android platform), using the computer for driving with a joystick or via the onboard keypad. You can even record movement and playback that are dialled in using the onboard keypad, making it the ideal situation for you to plan and execute missions throughout the home. Sporting a couple of accessory ports, the Bigtrak XTR can be further expanded using optional accessories (where each of them are sold separately) such as a missile launcher or an IR gun that are great ways to cause mischief. Not only that, there is also the wireless camera which allows you to “see” exactly what the XTR sees thanks to the computer command centre. With an intelligent loading bay that detects whenever you place something onto it, it is also one of the more fun and innovative ways of transporting snacks from the kitchen to your couch in the living room whenever you do not feel up to it. Talk about rolling back the years in style!